In this article, A Shade Above Window Fashions—located in Charlotte and Cornelius, North Carolina (NC)—are going to give you some insight into choosing the right window treatments for your Charlotte home. We proudly carry the full selection of Hunter Douglas blinds, shades, and motorized window fashions. There are a lot of things to consider when searching for the perfect window treatments for your home. Think about what you want from your window treatments. Consider your personal style and the decor of your home. Do you prefer a softer window treatment or the look of natural materials like hardwoods or bamboo? Do you need to block out harsh sunlight during the day? What are your privacy needs? Are you concerned about insulation and reducing home energy costs? These are some of the things to take into account when making your decision. Hunter Douglas has a wide variety of window treatment options to suit any home or decor. An important issue for most households, controlling the amount of sunlight streaming in during the day and light pollution coming in during night time hours can have a serious impact on the enjoyment you get from your home. If you have a room that gets harsh sunlight during the day, especially with southern exposure, shadings like Silhouette® are an excellent solution. Silhouette® filters and diffuses harsh sunlight, and transforms it into soft, enjoyable light. 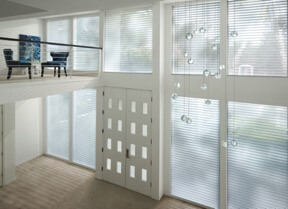 Another great option for light control is horizontal blinds. Hunter Douglas has a wide array of horizontal blind options, in several different types of materials and finishes, to complement your personal style. For both privacy and light control, consider plantation style shutters. Artisan Plantation Shutters for example, allow you to open specific sections to let light in and close others to keep prying eyes out. If the sunlight isn’t so much of a problem and you’re trying to cover a sliding glass door or large window, Luminette® Privacy Sheers are a great choice. If reducing your home energy bills is an important issue for you, Duette® is the gold standard when it comes to energy efficient window treatments. Due to their unique honeycomb design, Duette® insulates your windows and reduces the amount of work required from your home’s HVAC system. Duette® is available in the Top Down/Bottom Up operating system, which is ideal for light control and maximizing privacy. There are countless options when it comes to window treatment materials. For plantation style shutters and horizontal blinds, options include natural American hardwoods, faux wood and modern Polysatin™ materials that have the look of painted wood yet have the durability of new age materials. When it comes to sheers and shades, including honeycomb shades, Hunter Douglas offers a wide variety of soft, designer fabrics in varying degrees of light control and light blocking options. If you’re interested in bringing the look of nature inside, consider a woven wood shade like Provenance®. Also a great choice for privacy and light control, Provenance® Woven Wood Shades are made from bamboo, jute, natural reeds and grasses. They can be customized into thin banded or chunky weaves and the natural texture of your choice. You can add an optional liner on these shades for added light-blocking ability. Call A Shade Above today! Our experienced team can answer all your questions and guide you to the perfect window treatment for your home. Proudly serving the greater Charlotte area, visit one of our three conveniently located showrooms, in Charlotte and Cornelius, NC. Contact us today for an appointment to get started!